The 2018 edition of the WPT L.A. Poker Classic $10,000 Championship kicked off on Saturday at Commerce Casino. As many as 475 entries registered for the prestigious tournament during its first day, but only 282 of them will progress into Day 2, which will be played later today at the host venue. Action is scheduled to resume at noon local time and players who failed to join the field on Day 1 will be able to do that until the first break of Day 2 or around 1:45 pm local time. The tournament feature a freezeout format, which means that re-entries are not allowed. John Misirian will be leading the start-of-the-day pack of contenders. The player assumed the chip lead at some point on Day 1 and cemented his position on the very last hand of the day by eliminating poker pro Sean Winter. Misirian bagged and tagged 234,300 worth in chips for the night. The player comes fresh from a victory in an event that took place earlier during the ongoing LAPC poker festival. Talking with WPT staff, he said last night that that recent triumph had certainly built his confidence. Yet, he pointed out that one cannot be too confident, particularly in cases where the field is packed with poker professionals. Misirian revealed that playing with good poker players makes him feel more comfortable on the felt. The player went on to say that playing in an event that involves so many poker professionals provides opportunity to learn a lot. According to his Hendon Mob profile, Misirian has a total of $268,377 in live tournament earnings. It can also be said that the player has mainly cashed in three-figure buy-in tournaments over the course of his career. Day 2 of the $10,000 Championship will see the likes of Andy Frankenberger, Toby Lewis, and Richard Seymour take their seats after surviving the eight levels played on Day 1. However, former WPT Main Event champions Ryan Riess, Darren Elias, and Jared Jaffee did not make it through the day. Registration will remain open through the first stages of Day 2, as mentioned above, which means that the field will certainly grow. Once registration closes, organizers will be able to calculate the prize pool and to announce the places paid and the first-place prize for the last player standing in the tournament. Daniel Strelitz won the WPT LAPC Championship last year. The player bested a field of 521 entries to eventually scoop $1 million for his efforts. 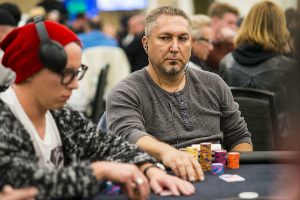 Streilitz entered this year’s event yesterday and survived through all eight levels to bag and tag 66,200 and secure a seat among the Day 2 participants. It is to be seen whether he will be able to win the exciting tournament for a second consecutive year. The Championship is set to be played through March 1. The post John Misirian Leads after WPT L.A. Poker Classic $10,000 Championship Day 1 appeared first on Casino News Daily.